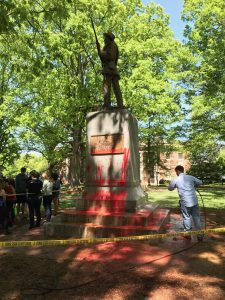 Red paint was placed on Silent Sam on UNC’s campus Monday afternoon. Protest at Silent Sam. Photo via Will Arrington. Eyewitnesses say one individual – Maya Little – was arrested at the scene. UNC officials did not identify the person arrested but said the individual would be charged with vandalism. 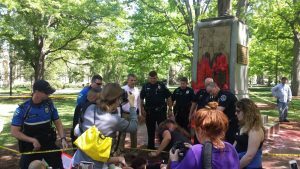 Little, a UNC student who has been one of the lead organizers of protests against Silent Sam, released a statement after a video appeared to show her being arrested Monday. I have been an organizer for the Silent Sam Sit-In since September 2017, when campus police confiscated the belongings of the 24 hour occupiers. Every weekday we provide context around the statue. This is an opportunity to teach. It is also our duty to continue the struggle against white supremacy that countless others have led since black students have been on this campus. The statue, a symbol of UNC’s commitment to white supremacy, has been defaced and protested since 1968. Yet the statue remains on campus 50 years later. These last 5 years Carol Folt has been chancellor and she has not taken a single step towards removing Silent Sam. The armed, Confederate soldier dedicated and built by racists during Jim Crow has remained. However, the dedication and courage of each successive group of students fighting for racial equality at UNC has made our message louder and clearer. The threat of Neonazis and white supremacists marching on our communities has made it more urgent. Paint being washed off of Silent Sam. Photo via Lilian Heil. Chancellor Folt and the administrators are more dedicated to silencing us. In her first two years, there was no state law against removing the statue. She has heard countless activists tell her the statue’s presence dehumanizes and threatens people of color. The governor has written an open letter asking her to remove the statue. White supremacists have marched around Silent Sam and threatened violence. How has Folt responded? She has called us outside agitators. She has refused to call a statue dedicated for and by proud racists, white supremacist. She has never met with members of the Sit In. She has allowed white supremacist groups to invade this campus. She, Derek Kemp, and Jeff McCracken appointed a campus police officer to go undercover, lie about his identity, and gather information on us. According to McCracken, they continue to spend $1,700 dollars per day to protect the statue. But UNC does not want this context. Chancellor Folt will order Silent Sam to be cleaned immediately. But she should clean my blood and the ink off Silent Sam, not campus workers. The Chancellor and all who have used their power to keep Silent Sam here must embrace the truth about UNC. UNC is Silent Sam. 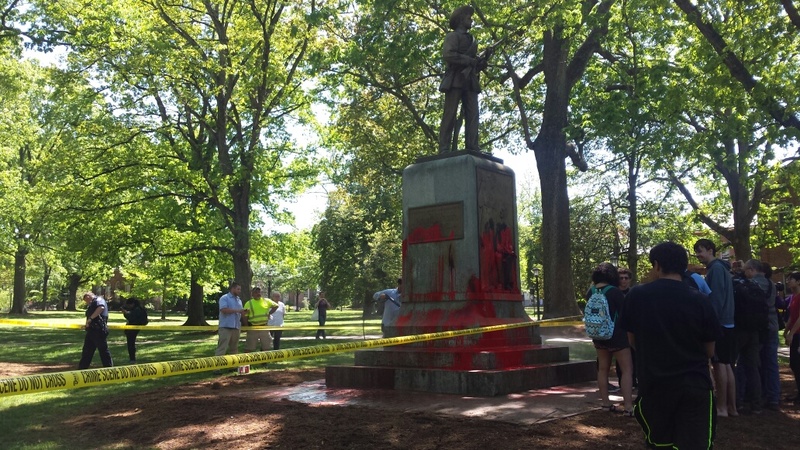 Chapel Hill is Silent Sam. The statue stands smirking and defiant representing a community that has failed many times to work for justice and racial quality. Chancellor, the blood is on your hands. But we are not silent. The statue will be contextualized to show UNC’s racist past and present. You, Chancellor Folt—and your donors, the students you recruit, the alumni you cater to—will be forced to see it until every facet of white supremacy on this campus has been removed. “…smirking and defiant…”? Gimme a break!